Vasco de Gama is an excellent game so I was intrigued to see what Libertalia was like as it’s by the same designer. Players blind bid cards to win tokens which determine victory points. Each player has the same deck of cards to bid with but a random set is drawn for each round by one player and the other players use the same mix of cards – so the players’ hands are the same each round. It looks clean and simple, and sounds like it will play the same too. Players move along a straight road and can rush ahead to secure places before other do, but at the expense of missing out other locations where points could be earned. Reminds me a bit of the worker placement in Egizia (which was really good). Also, I’ve always been impressed with FunForge’s production quality. This game got my attention when it was on Kickstarter last year. Sadly, I never managed to get to play the print-and-play version, but the game sounds simple but with meat to it. Players place knights, nobles, priests, etc. to try and achieve their objectives. Intriguing game mechanic of rondel-style play mixed with building and resources. The rondels are the players’ boards and these change during the game as the player builds locations and others disappear as the player completes circuits. So, a little element of the excellent Village in there too. Intriguing mixture of game mechanics combining area control, bidding, and card combination as players travel from stop-to-stop along the Congo River in 1884. Seems to be all about using the right character at the right location with the right additional support cards. A game by the designer of Fresco which looks to combine area control, but with some other mechanisms too. Looks clean and simple – hopefully has some good decisions although I’m not sure how deep it is yet. Nice friendly theme of tiling the floor of the Taj Mahal. More new releases for Essen to come. I’ve combined all the games on my radar for Spiel on the Essen 2012 page. I read the rules for Village when I was at Essen last year and as soon as I saw the meeple laying in the history book or in the unmarked graves I knew I wanted to play it. I pre-ordered it and I’m glad I did as I’ve really enjoyed every game I’ve played of it so far. More recently it rightly won the complex Spiel des Jahres award too. The reason it’s a great game is due to an interesting mix of some unusual game mechanics – none are complex but there’s lots of variety – so I shall attempt to summarise the main elements. 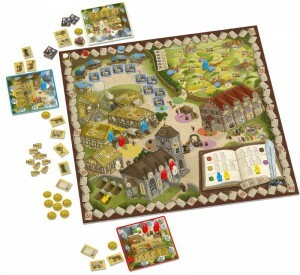 In Village, players use their villagers (meeple) to do various tasks and the goal is to earn the most respect (victory points – VPs). There are two key mechanisms in the game – time and actions. The theme of selecting a new pope may not be as broadly inspiring as that of pirates or city building, but don’t let this put you off as 1655 Habemus Papum is a surprisingly great game. Essentially, it’s a bidding game as players blind (simultaneous) bid gems to determine in what order the players will take one of the 4 cards on offer each round. The goal is to be voted pope at the end of the game which you do by collecting votes. You start with a few gems which have a strict hierarchy: diamonds, rubies, sapphires and amber in descending order. Each round 4 cards are on offer – one from each of the 3 decks plus the start player card. Players secretly put 0-3 gems in their hand and simultaneously reveal. The player with the most gems (any colours) picks a card first, then the player with the next highest total of gems, etc. If players are tied on quantity of gems then the quality of the gems is compared – players compare their most valuable gem, then the next and so on. If players have bid identical gems then the person closest to the start player going clockwise wins the tie. After an extended break, I’m pleased to say that new reviews will start being added to the Metagames blog – starting today with an excellent bidding game. Why the break? Unfortunately, I had to turn my attention to personal and business matters over the last months which just didn’t allow me the spare time to write new reviews. I was always disappointed not to be able to post new reviews, but I knew I would return to reviewing games at some point as soon as I was able. So, thanks to everyone who has kept checking the site, following on Twitter and subscribed to the RSS feed. I won’t be adding a new review every day as I did for long periods before, but they will be fairly regular. Please check twitter or subscribe to the RSS feed so you’ll know when new reviews are posted.